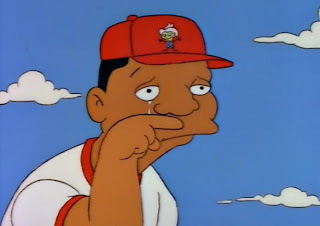 With the recent retirement of Ken Griffey Jr, all of Mr. Burns' ringers from the Homer At The Bat episode of The Simpsons have officially retired from baseball (h/t to @VictorRojas29). That was episode 17 of season 3 or for all of you nerds, 8F13. 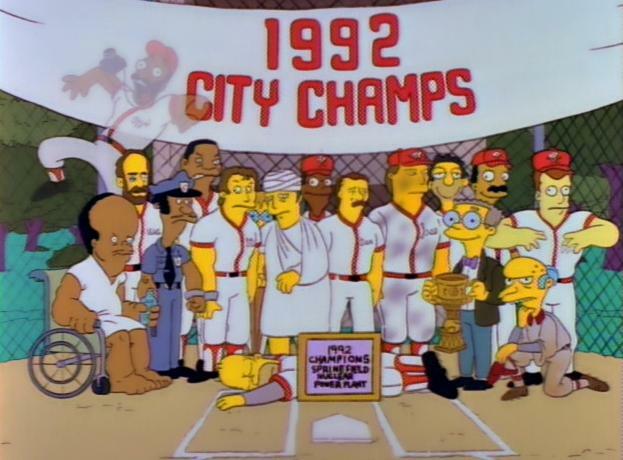 Let's all pile in the way back machine and take a look at the greatest fictional softball team in the history of cartoon sports. In 1992, Homer was trying to get his fellow employees to sign up for the softball team after they went 2-28 the prior season. This season, however, Homer had a secret weapon. He carved a bat out of a branch that was struck by lightning during a storm. 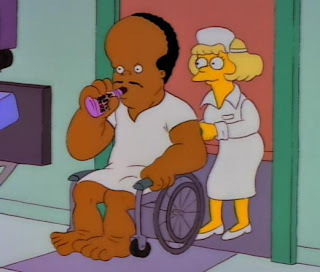 *Fun Fact 1: Homer used a large piece of sheet metal for shelter during the storm* By Homer's gorilla math, in 30 games with 10 at bats per game, he would hit 3000 home runs with Wonder Bat. Of course, Homer homers the team into the championship game against the Shelbyville Nuclear Power Plant. 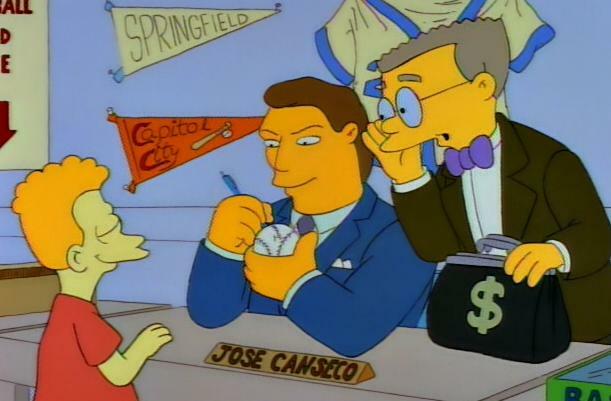 Mr. Burns made a million dollar bet with Shelbyville Plant owner Aristotle Amadopoulos. Determined to win by cheating, Burns decided to put together a team of ringers led by Honus Wagner, Mordecai "Three Finger" Brown and dead-for-130-years Jim Creighton. *Fun Fact 2: In 1862, Jim Creighton never made an out at the plate for the entire season* Since Burns was unable to attain the services of these players, he had to turn to active major league stars. Sadly, most of them would never make it to the game. Let's take a look at the lineup that never was and don't forget that the fourth inning is the beer inning. In 1991, Clemens went 18-10 with a league best 2.62 ERA and 241 strikeouts for the Red Sox. He won the AL Cy Young and finished 10th in MVP voting. Highlights: Broke Homer's Wonder Bat with a pitch during batting practice. Mistook Homer for Ken Griffey Jr.
Misfortune: Burns hired a hypnotist to get the team to give their maximum effort. 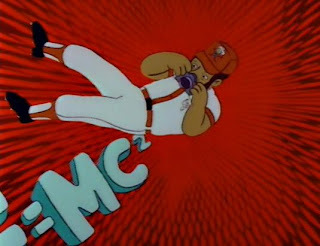 But like in every hypnotic mishap, Clemens ended up thinking he was a chicken and couldn't pitch in the big game. In 1991, Boggs hit .332/.421/.460 for the Red Sox. He was an All Star and won the Silver Slugger award for third base. Hightlights: He ate chicken before every game and took batting practice at 5:17. 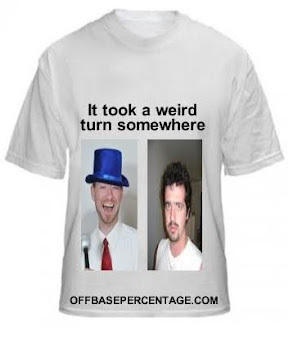 Needless to say, third base wasn't really a position of focus in the episode. 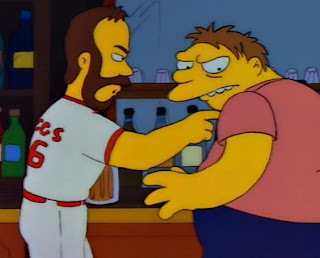 Misfortune: While enjoying a beer at Moe's, Boggs got into the popular bar debate with Barney over who was the greatest British Prime Minister of all time. 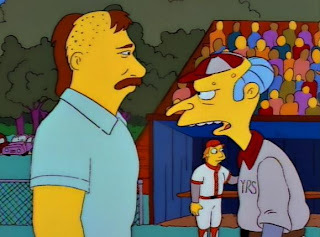 Boggs defended Pitt the Elder while Barney is more a Lord Palmerston man. Lord Palmerston, come on. He was barely awarded the Order of the Garter by Victoria in 1856. But Barney knocked Boggs out anyway and Wade never made it to the big game. Griffey was only 21-years-old in 1991 and just finished his third season with the Mariners. He hit 22 home runs and .327/.399/.527. He was an All Star and won a Gold Glove and the Silver Slugger award for center field. Highlights: None, doomed from the start. While mainly playing second base for the Yankees in 1991, Sax hit .304/.345/.414. Perhaps Robbie Alomar didn't like The Simpsons in '91. Highlights: Played in the Steve Sax trio. Drove an automobile. 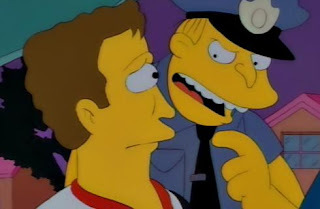 Misfortune: Sax got pulled over by the capable Springfield police and they discover Saxy was from New York. They charged him with all of the unsolved crimes in Springfield and he faced up to 6 consecutive life sentences. The 36-year-old short stop hit .285/.380./.367 while swiping 35 bases in 1991. He was an All Star and won his 12th consecutive Gold Glove at short stop. Highlights: Impressed by Elvis' lifestyle because he used to relax while watching three TVs at once. Wore an old man Hawaiian shirt. Misfortune: Smith took a visit to The Springfield Mystery Spot (Where Logic Takes A Holiday And All Laws Of Nature Are Meaningless) and fell into some sort of wormhole to another dimension. That happened to my friend Beavis once. He drinks a lot of beer now. Canseco led the American League in home runs with 44 in 1991. He wouldn't hit over 40 again until 1998. That's just some bad dope. In 1991, he also hit .266/.359/.556 in his last season in Oakland. Misfortune: After he forced a rewrite, Canseco ended up missing the game while saving a woman's furniture from a house fire. What a swell guy he is. 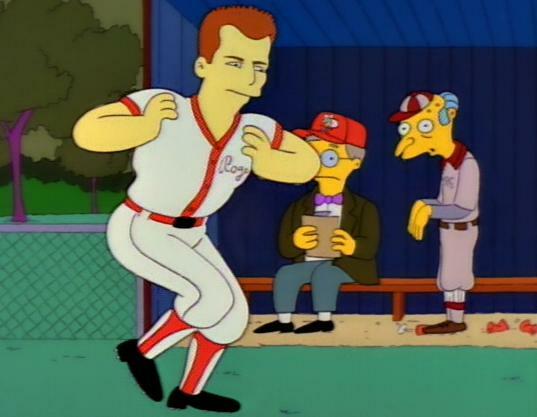 Mattingly hit .288/.339./.394 while playing Gold Glove defense at first for the Yankees. I have nothing against Mattingly but I don't understand the people who think he's a Hall of Famer. Even in his MVP season, George Brett had a much better year. Sorry, Derwood. In 1991, Strawberry played his first season away from the Mets with the Dodgers. He hit 28 home runs while batting .265/.361/.491 and it was good enough to make him an All Star. Homer Simpson: You're Darryl Strawberry! Misfortune: The percentages. Otherwise, he was the only ringer to make it to the championship game. Scioscia hit .264/.353/.391 in his second to last season catching for the Dodgers in 1991. He would go on to manage my beloved Halos to their World Series championship in 2002. Highlights: Hauled radioactive waste. Shot Smithers after mistaking him for a deer. Dream job included big machines and cool dials. 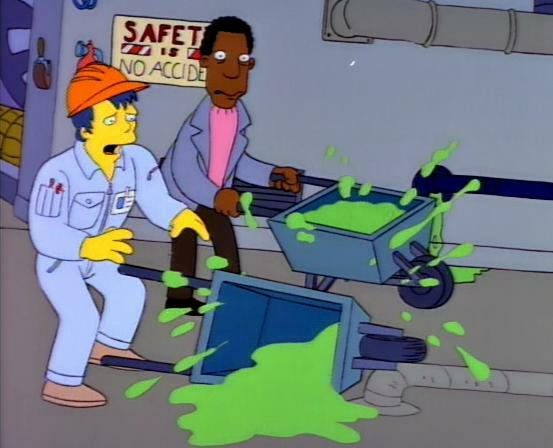 Misfortune: Acquired an acute case of radiation poisoning leaving him unable to lift his arms or speak at a normal rate. The walk-off hit by a pitch. Boy did Springfield get drunk that night. Great post. Thanks for this useful information.